Well-differentiated liposarcomas in the paratesticular region may undergo de-differentiation, usually in older men. The diagnostic criteria for de-differentiation are the presence of lipoma-like and/or sclerosing well-differentiated liposarcoma juxtaposed to a de-differentiated component occupying at least one low-power field (x10). Low-grade de-differentiation (as shown here) consists of spindle cell areas devoid of lipogenic differentiation and having greater cellularity than that encountered in sclerosing well-differentiated areas. Mitotic activity may not be appreciably increased. 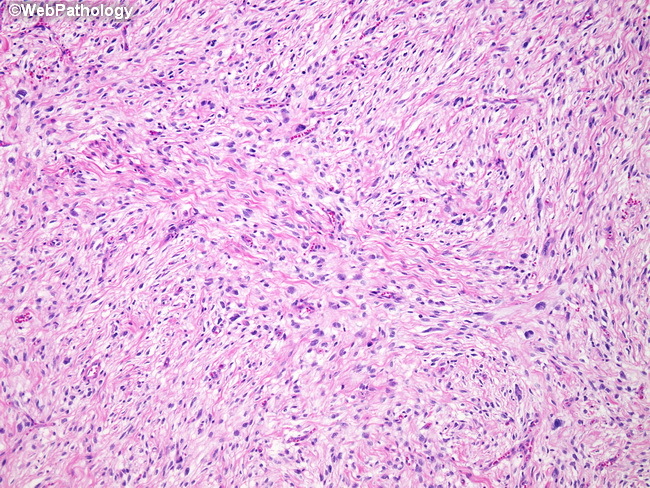 The appearance of de-differentiated foci resembles a low-grade fibrosarcoma. High-grade de-differentiation resembles a high-grade fibrosarcoma, myxofibrosarcoma, or undifferentiated pleomorphic sarcoma. Given the resemblance of de-differentiated liposarcoma to other high-grade sarcomas, it is not unreasonable to perform MDM2 and CDK4 immunostains in spindle cell sarcomas of the spermatic cord. Both markers are overexpressed in well-differentiated and de-differentiated liposarcomas secondary to multiplication of the 12q13-15 region. Despite the presence of de-differentiation, the prognosis in such patients is still favorable. A recent study of de-differentiated lipoarcomas of the spermatic cord found a recurrence rate of 22.6%, metastatic rate of 6.5% and disease-specific mortality of 6.5%. Ref: Kryvenko ON et al. Dedifferentiated Liposarcoma of the Spermatic Cord : A Series of 42 Cases. Am J Surg Pathol 39:1219-1225, 2015.